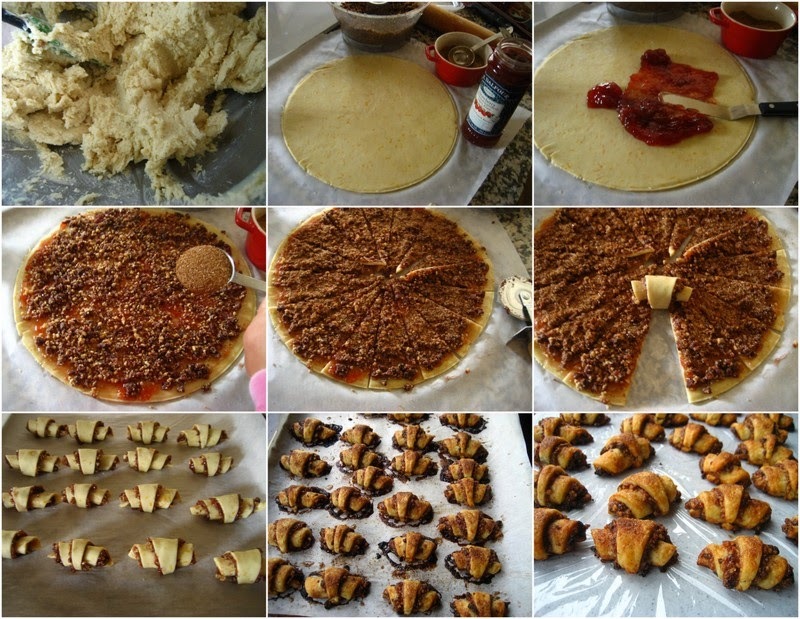 Strawberry-Pecan Rugelach... Ok, so we've probably all heard about rugelach cookies... they've been around for a long time. Originally dating back to Jewish origin, the rugelach is a crescent type of cookie that's filled with a myriad of fillings. Rugelach cookies may be known in different countries by different names... and in Romania, rugelach are simply known as "cornulte". Romanians like to fill them with bits of Turkish delights and cover them in plenty of powdered sugar. Tip: Dough needs to be chilled for a couple of hours or more... so plan ahead. Ingredients: adapted from Family Baking Book (ATK)... makes about 32 cookies, recipe can easily be doubled. 1. Beat the butter, cream cheese, sugar, vanilla, rum and almond extracts(if using), orange zest and salt together until light and fluffy.... about 3-6 minutes. 2. Scrape down the sides of the bowl as needed. 3. Reduce speed and add flour. Mix until just combined.... about 30 seconds or so. 4. Remove dough from mixer bowl and place onto a floured counter. 5. Divide dough into two equal pieces. Wrap in plastic wrap, and refrigerate until firm, about 2 hours or so. I left mine overnight in the fridge, and then took it out to soften a bit on the counter before rolling. 1. Roll each piece of dough into an 11 inch circle, about 1/4 inch thick. I ended up using a large dinner plate to cut a nice circle, but it isn't needed. 2. Spread about 1/4 cup of the jam on top of each round. 3. Sprinkle each with 1/2 cup of pecans. 1/4 cup dried fruit of choice, if using and 1 tablespoon of the cinnamon sugar. You could use less of the cinnamon sugar, if you like.... I did. 4. Using a pizza cutter(or knife), cut each dough round evenly into 16 wedges. 5. Roll up each wedge(starting at the wide end) into a crescent. Place the cookies on the prepared baking sheets, with the pointed end underneath. 6. With the pointed end of cookie on the bottom, place each cookie about two inches apart unto the prepared cookie sheet. 7. Brush the melted butter over the cookies and sprinkle with a tiny amount of the remaining cinnamon sugar. If you use too much sugar it will eventually burn as it bakes... so use minimal amount and place it only on top of the cookie... use about a pinch. 8. Bake cookies until pale gold and slightly puffy, about 20 min. 9. Immediately transfer the hot cookies to a wire rack... removing any burnt sugar/filling that may have leaked out around the cookie... and cool completely before serving. Don't allow the cookies to cool on the cookie sheet as it will be hard to remove the baked on sugary filling around the cookies.... and they won't look pretty. 10. Dust with icing sugar if desired. These look delicious! I crave some "cornulete" now :) I'd like to try them tomorrow, but I don't have any cream cheese in the house. Can I substitute it with anything? Alina, I haven't tried subbing the cream cheese, as the cream cheese makes the dough tender and softer... really don't know if there's a good alternative substitute. However, I have seen cornulete recipes online that simply use all butter for the dough. You can try subbing all butter, though you might need to cut down on the butter a bit... and maybe adding a bit of water, even a bit of vinegar to make the dough tender. Hope that helps... and thanks for stopping by.